The increasing use of high-quality digital printers has created a need for a laminate film that will work reliably with the toners these printers use. 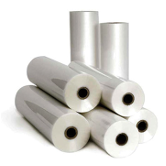 Extra Bond (EXB) laminating film was specifically designed for modern digital copiers that use fuser oil. It will adhere to large areas of toner and other materials where standard high melt films will fail. Rolls are adhesive side in. Applications: Digital prints from Xerox (Docutech and Docucolor), Nexpress, Xeikon, and similar printers. Other names include: Super Stick and DryLam SAP.